It was born as guide on what to do in San Gimignano in January, then I said, oh well, it will be about San Gimignano in the low season… If I wait a few more days, it will become a retrospective on how clever it would have been to visit San Gimignano before hordes of tourists block the medieval streets of my mother’s town. Hello deadlines, hello editorial calendar, we’re already having relationship problems and it is just March! San Gimignano is probably one of the best known towns of Tuscany, renowned for its towers, its medieval atmosphere and its gelato, but for me it has a completely different charm. This is the beginning of their love story with San Gimignano as a backdrop. Since then, every time I walk past Piazza della Cisterna I can see my father proudly parking his Fiat in the square and my mother with her group of friends noticing for the first time that foreign guy sitting on the bonnet of his red car. Fast forward a few years, and I was born on the 27th of July, even though I was due around the 10th of August. 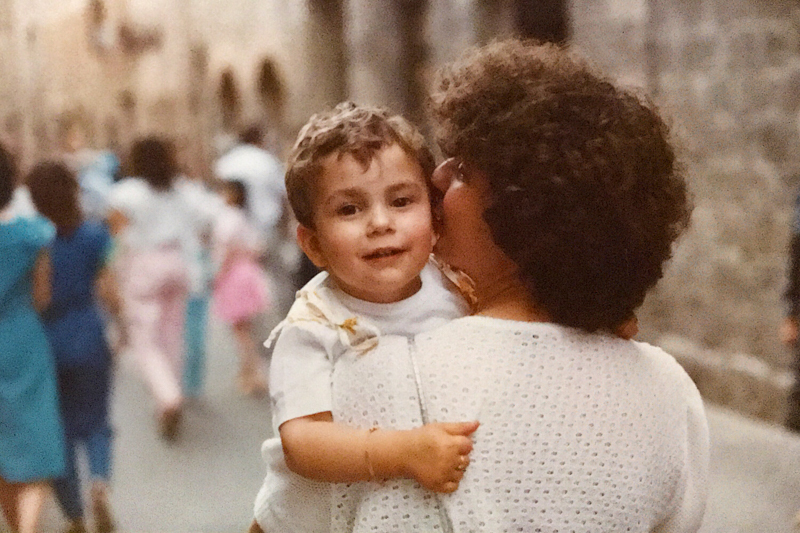 The reason for this untimely birth can be found in my mum’s run in San Gimignano on a steep street, looking for my aunt, who was probably chatting with some friends somewhere near the Duomo. I’ve spent most of my childhood and teenage Saturdays in San Gimignano, with my granddad Remigio, my aunt Silvana and my cousin Margherita. My summer were studded with movies under the stars in the medieval citadel of San Gimignano, chats with old ladies sitting on a tiny straw chairs just outside of my granddad’s house, running back home as soon as the tower bells struck ten. 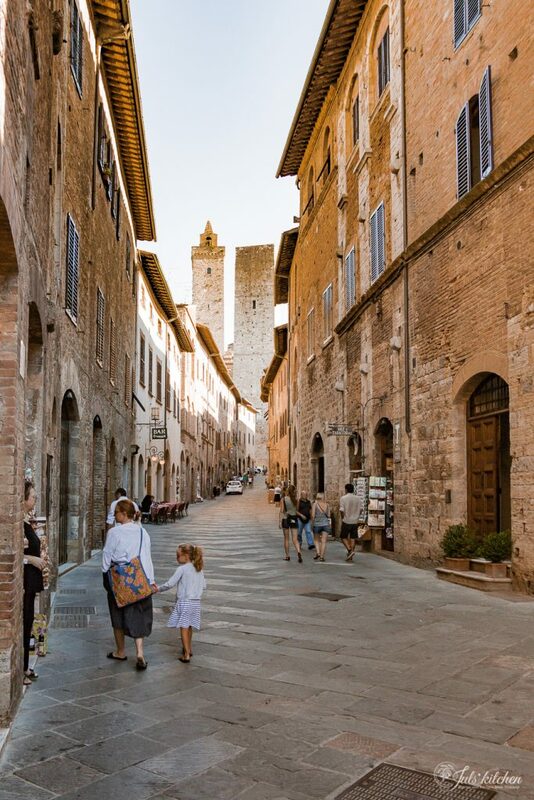 San Gimignano for me is pine nuts, rice pudding tartlets and an enormous slab of schiacciata with olive oil puddles, gelato after dinner on summer nights, a packet of chewing gum bought at the bar when my parents would have a coffee instead. San Gimignano was different twenty years ago. My mother’s aunt, zia Lella, had a tiny shop on the main street: she would sell everything from toys to hats, tights, scarves and foulards. Her clients were local people. Now a tourist leather bag store replaces her quaint shop. For years I avoided San Gimignano, scared by mass of tourists and the eerie feeling it was no more a town designed for its inhabitants but for hit-and-run tourism. I admit that I recently changed my mind, though. Showing San Gimignano in a summer night to Tommaso during our first date as a couple sharing a slice of pizza and a glass of vernaccia certainly helped. 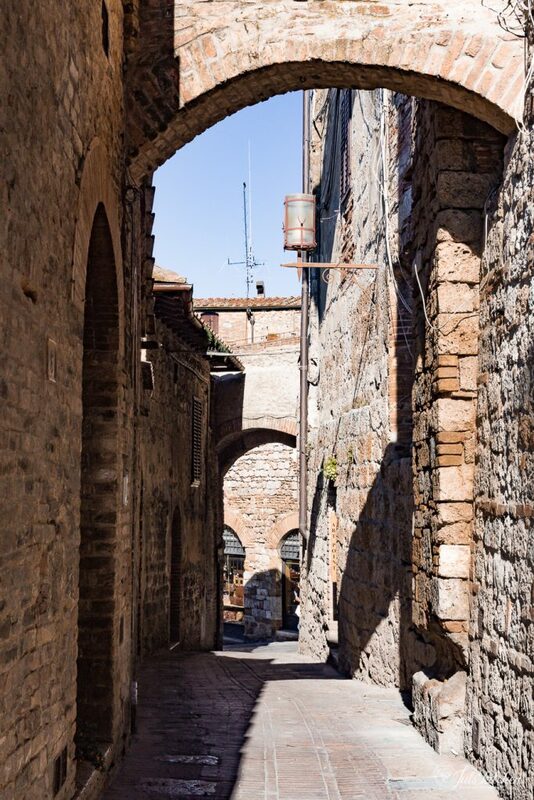 Going back to San Gimignano with mum in an early morning and walking again together along the streets and back alleys where she grew up, re-discovering the familiar sights and the smells that never changed helped, too. Recently Sarah, whose family run the charming Poggio Alloro organic farm, organized a tour of San Gimignano for a small group of friends, so just before Christmas Tommaso and I drove there to explore and re-discover the medieval town with Georgette, Emiko and Molly. This is when the idea of this post was born. 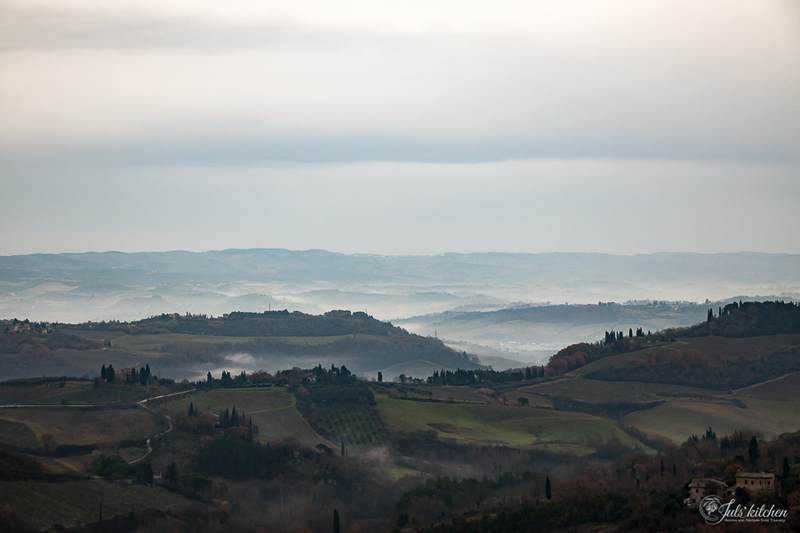 Visit San Gimignano preferably off-season during a week day. The rain and the mist add mystery to an already charming town: you can seek refuge in a bar, in the Contemporary Art Galleria Continua or in the Duomo, where you can admire the beautiful frescoes, the biblia pauperum, the Bible of poor (and illiterate) people, that used to fascinate a younger me, diligently sitting during the mass at Easter. 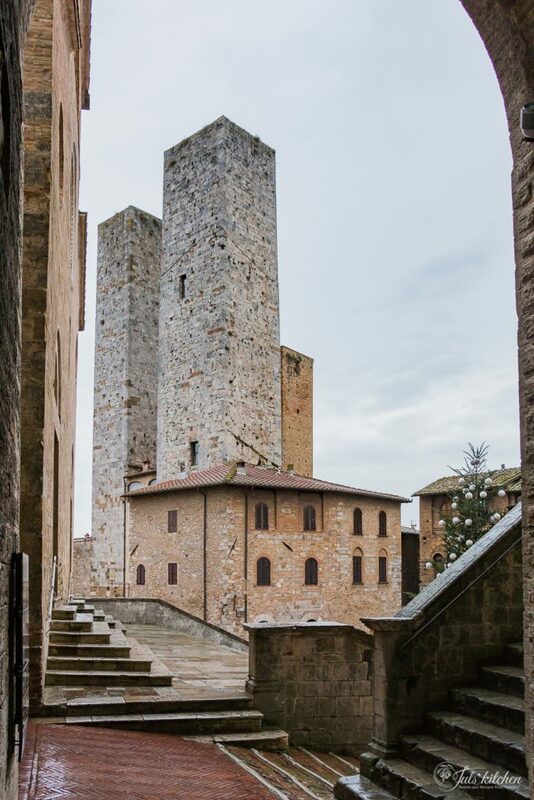 If you missed the off-season, as I did with this blog post, opt for the early mornings or the late afternoons, when most of the tourists leave San Gimignano. 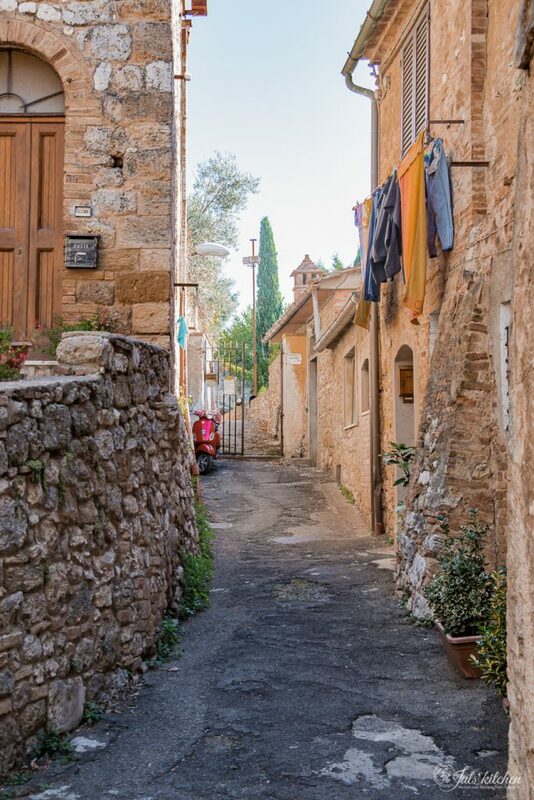 This is when you can feel the town slowly coming back to an ancient life, when the inhabitants reclaim their streets, their cafés and their squares. Avoid the weekends, when it is quite difficult to find a place to park your car and you might be forced to leave it miles and miles away. Be clever and choose a week day, a random Tuesday, or a Thursday, if you want to hide among the locals at the weekly market. 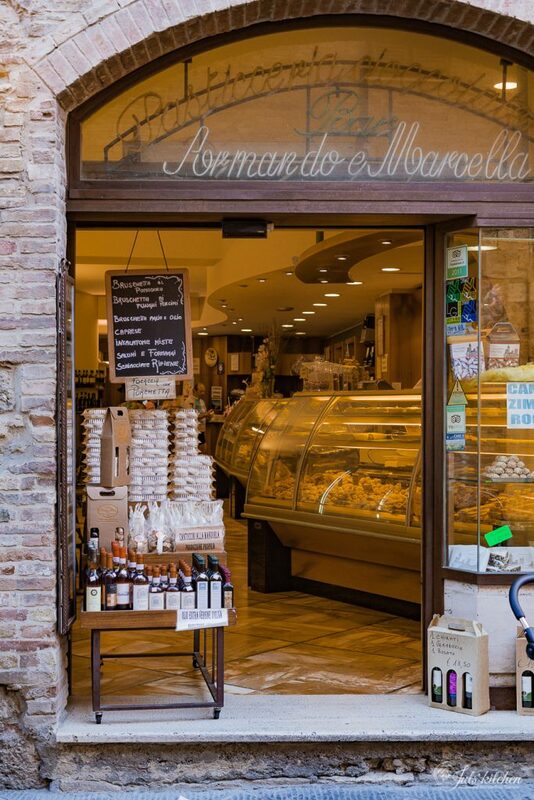 Walk along the streets paved with large stones, sniff the air to locate bakeries and forni, as in San Gimignano you can buy the best schiacciata, thick, salty, generously doused in good olive oil. 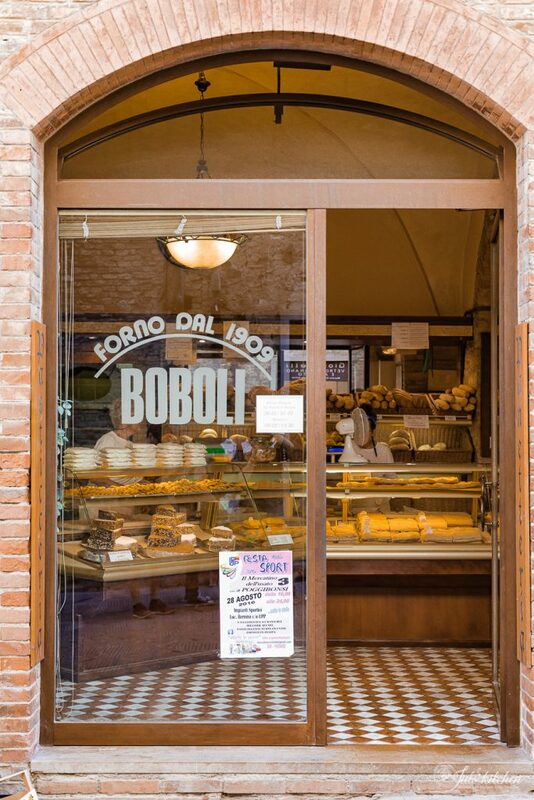 Panificio Boboli, forno dal 1909, Via San Matteo. Buy here the schiacciata, panini with porchetta and other charcuterie, focaccia with olives, cookies and bread. Perfect for a quick lunch or a merenda. Caffé Giardino, in Viale Roma, 17, just outside the San Giovanni gate. They make an enormous cappuccino with a lavish milk foam, a perfect espresso and the most incredible crostoni, which can appeal those who swear by a savoury breakfast or those who want a quick and satisfying lunch. We tried a persimmon and gorgonzola crostone which is still tickling my taste buds. Armando & Marcella, in via San Giovanni, 88. The café is exactly like it used to be in the ‘80s, same light, same tables, same overcrowded counters with every kind of biscotti, pastries, Sienese sweet treats and candies. This is where my mum and aunt used to stop in the morning for a cappuccino and a budino di riso, a rice pudding tartlet, which is still my favourite breakfast in a bar. Slightly warm, with a crumbly and fragrant pastry shell and a creamy rice filling, this is the place to stop for a classic Italian breakfast. Food shopping? La Buca di Montauto, in via San Giovanni 16, with good charcuterie made with their wild boar, wine and other local products. You will recognize the shop from two wild boars proudly guarding the entrance of the shop. Osteria del Carcere, in Via del Castello, 13. 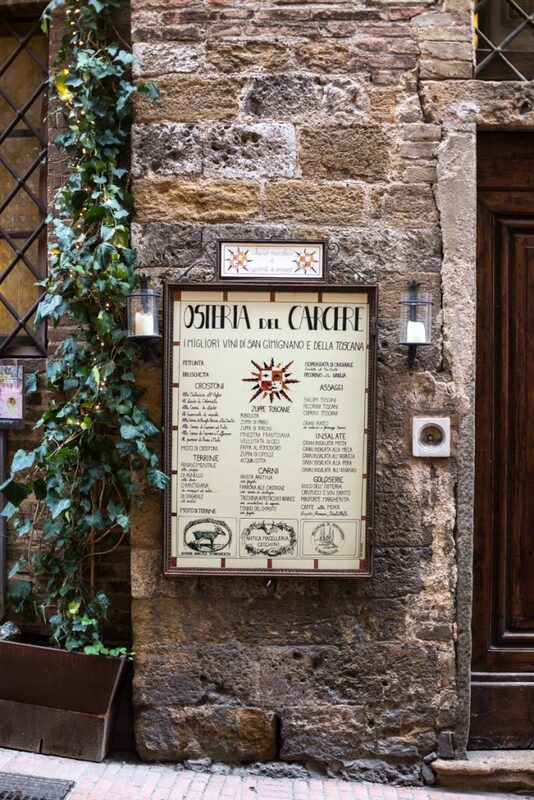 Right next to Piazza della Cisterna, this is the place to go to treat you to a traditional and high quality lunch or dinner. They don’t serve pasta or pizza, but you’ll soon forget you carb addiction as they have the most exquisite soups, with porcini, onions, vegetables… if you can’t decide, you can have two or even three small tastings. They have also cheese boards, terrines, roast meat and a good selection of home-made desserts. Gelateria Dondoli, in Piazza della Cisterna, 4. Known all over the world, they claim to be the best ice-cream in the world. It is a challenge you must accept and taste their sublime, natural gelato, made only with the best seasonal ingredients. Some of my favourite flavours: champelmo, a champagne and grapefruit sorbet which can help you fight the heat of summer, Curva Fiesole, with blueberries and fresh ricotta, and Rosemary baby, with raspberries and rosemary. Outstanding chocolate and pistachio, of course. 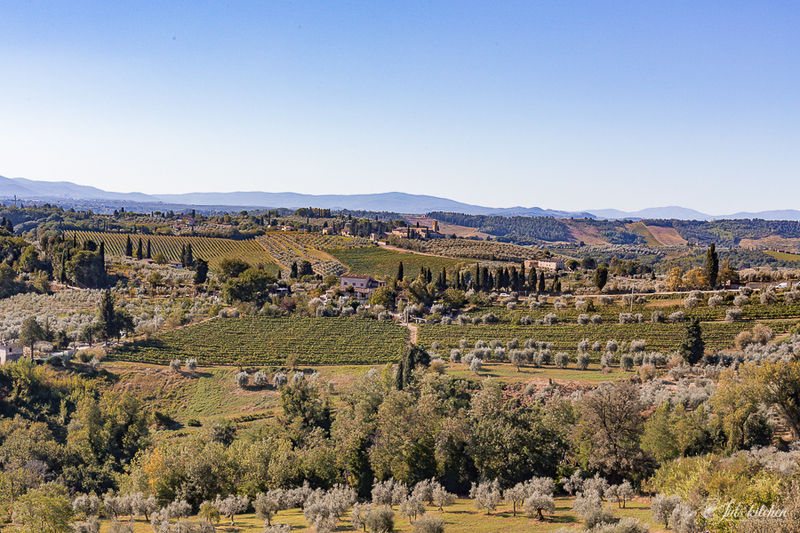 Fattoria Poggio Alloro, a few kilometres far from San Gimignano there is Sarah’s farm. If I think at the perfect idea of the classic farm with animals, fruits and vegetables, olive trees and vines, a few cats and a dog, people working together from sunrise to sunset as if they were a family, the first thing that comes to my mind is Poggio Alloro, an organic farm and agriturismo overlooking San Gimignano. They do not work as a family, they are a family. You can read more about it here. 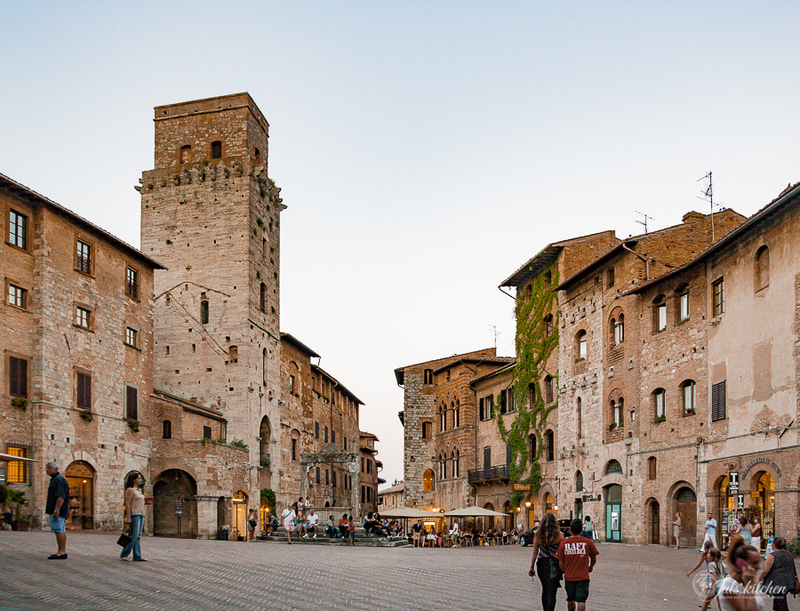 Have you ever been to San Gimignano? What did you love about the town? Or, is there something you did not like? Tell me about the gelato, for example! Share your experiences and memories in the comments, link to your posts or to places you liked! More guides on the blog! 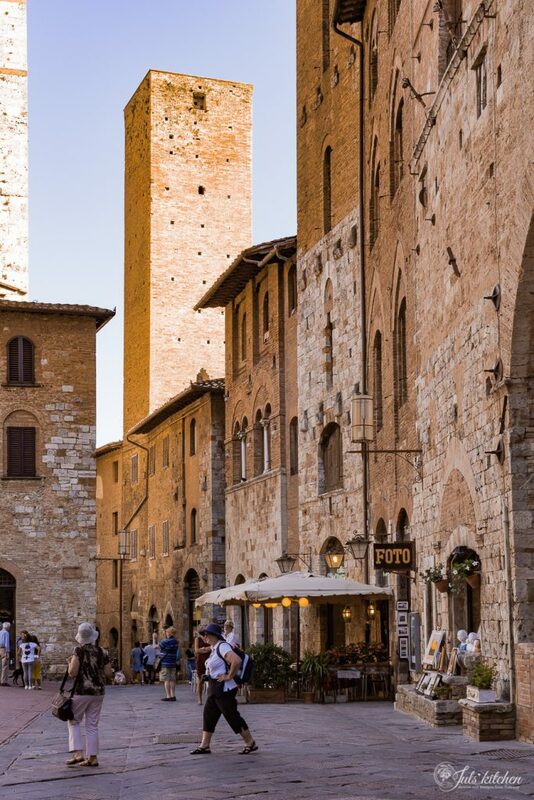 Do you want to visit San Gimignano with us? 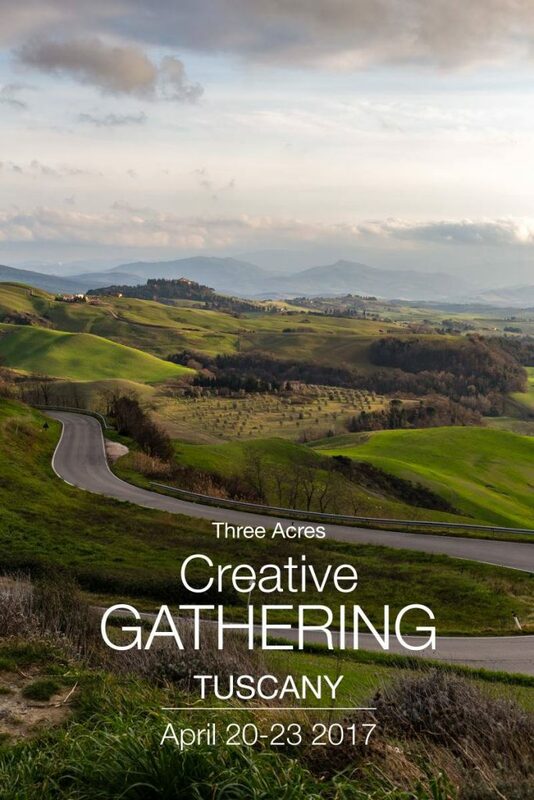 Join us for a Creative Gathering which will celebrate the seasonal food and the pleasure of getting together in a quiet location in the Tuscan countryside. There will be time to chat, experiment, cook and eat together, head to the market to discover local seasonal ingredients, knead a good loaf of sourdough bread and light up the wood burning oven to bake bread and pizza. We will learn to set up a beautiful table with flowers and to make our own natural cosmetics, we will talk about inspiration and creativity, photography and writing, we will create new bonds and discover medieval hilltop villages here in Tuscany, all in a friendly and curious atmosphere. Thanks for the trip down memory lane. Everyone should visit…just not at once over the summer! I so enjoyed reading this post and seeing the pictures of your mom and dad in their young years. I can now imagine the red sportscar and the smile on your father’s face. What a lovely memory to share and how special that you were able to re-discover your love for this quaint little towery town. A lovely, heartfelt post. 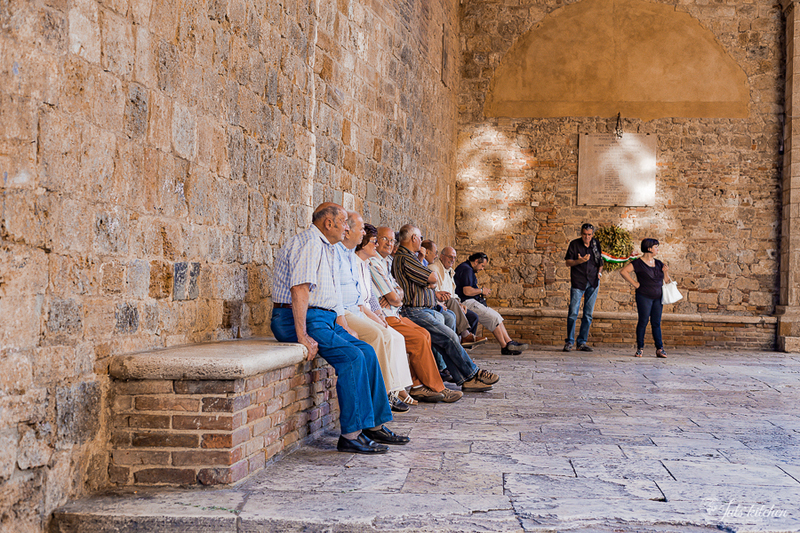 I have visited San Gimignano several times and although it is thronged with tourists ( as I am one), I loved it all. 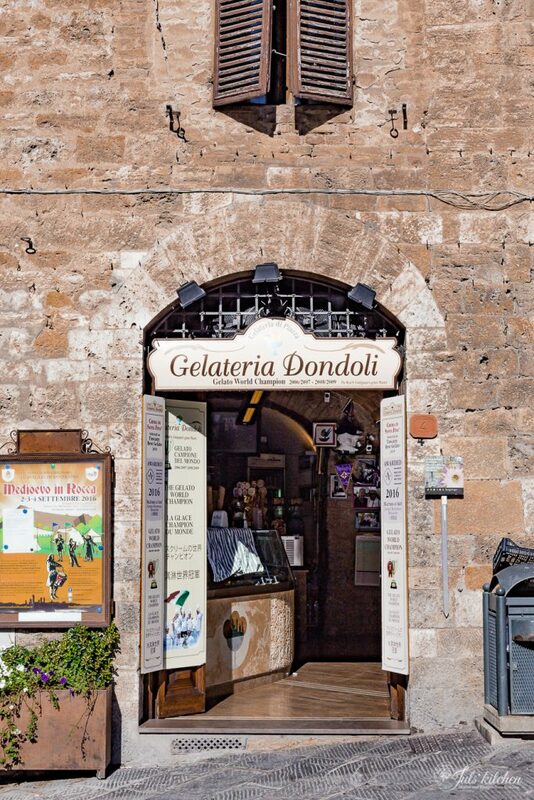 Especially…The Gelato…the best I had tasted anywhere in Italy. GREAT post Giulia, I can’t believe your mom met your dad here, what a small world indeed <3. Can we go on more adventures together? We’ve been to San Gimignano almost every year of the last decade (which is quite something coming from the west coast of Canada). We come here again and again because we simply have fallen in love with the town and surrounding area. Just thinking about it tugs at my heart. I agree that early mornings and evenings are the better times to visit but if you stay outside of the town as we do and have a rental car it is easy to take advantage of the best of the town and it’s surroundings. 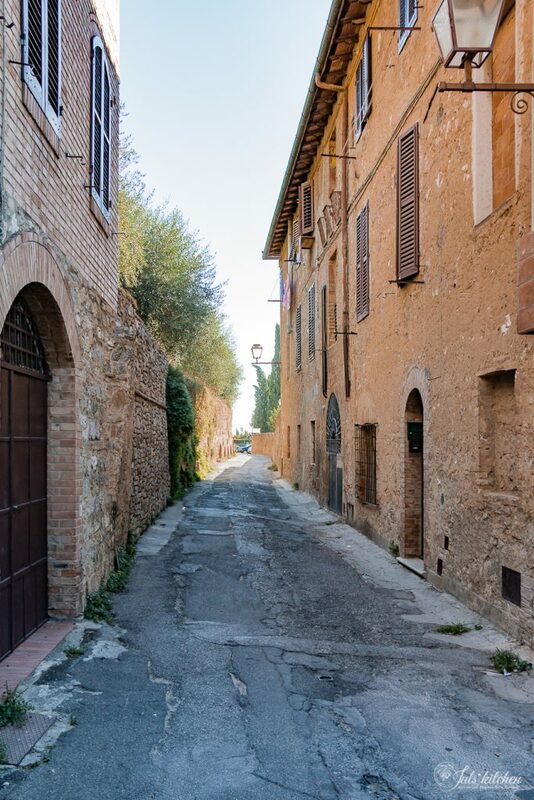 Go for a country walk as we’ve done on a section of the Via Francigina (a memorable walk on the pilgrim’s path) or take a drive to Volterra- a town that rivals SG for beauty. We always stay at the Hotel Pescille about 3 km outside of town where the beautiful simple rooms look out over the fairytale countryside to the towers of the town. When we need to take a break from the excitement of town we can relax in their gorgeous garden and have a swim in the pool. I can’t wait to get back to this bit of Paradise. 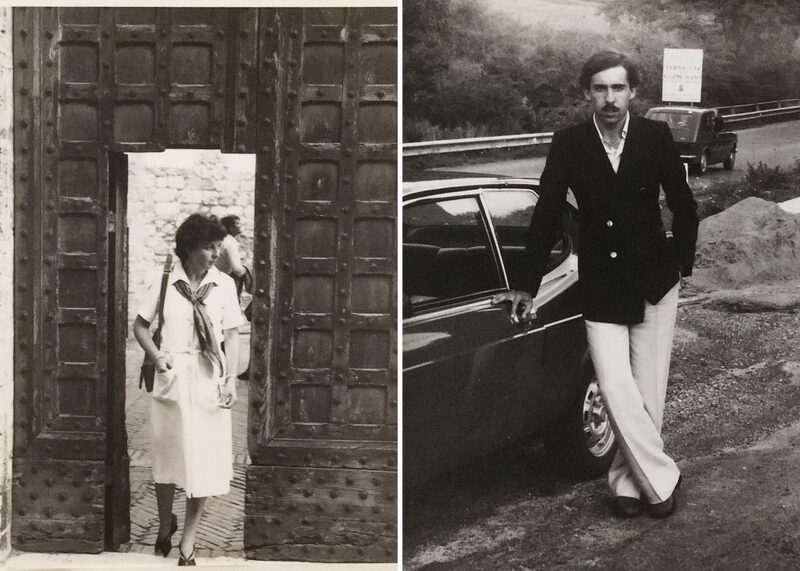 My first visit to Italy was in 1978, the year I graduated from college and my Dads first time back to Italy since he immigrated, by himself at the age of 12, 44 years earlier. I remember Sam Gimignano as a quiet town with artists and craftsman in their workshops on the street level. It was a wonderful time with the most important person in my life and I still have the 2 framed paintings on copper I bought there 39 years ago! I will be walking the Via Francigena this June with 5 friends spending the night in San Gimignano and I will be thinking of my Dad who passed away 27 years ago. I love SG. One of the very first tuscan cities i’ve ever been. 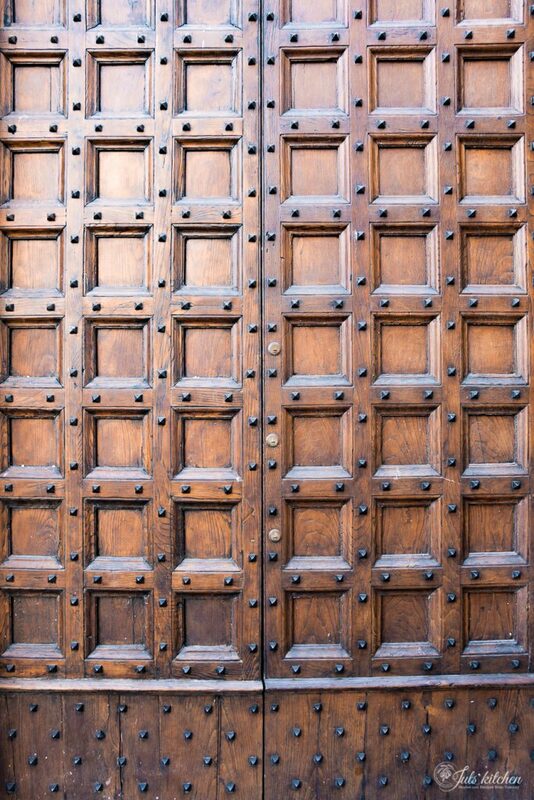 I love these old walls smels wonderfuly. I love the view from city. I love fresh vernaccia in hot sunny day. I don’t like those crowds like all humanity came into one place 😉 So i must came to San Gimignano in winter! really helpful for my job 😉 Ciao Giulia! We visited SG after taking one of your cooking classes two years ago. We loved the town, especially the Gelato and the proprietor was loudly hawking his wares as we walked by. It was wonderful. 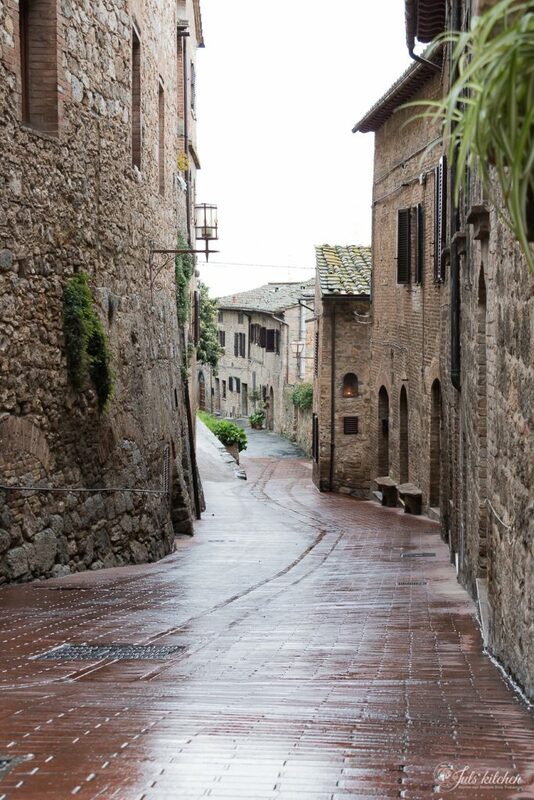 We expect to visit Volterra next month and Sienna. Can you and Tomasso have lunch with us, (our treat) in Sienna? We’ll call when we are in Tuscany. We arrive on the 19th and leave on the 25th. Tell us what day works for you for lunch and we’ll adjust our schedule accordingly. I visited San Gimignano a year or so ago and fell in love with the beautiful town. I was particularly happy to find an open air antique’s market. I bought a beautiful perfume bottle with an “argento” silver stopper. I love it. Once again I will be going back in the fall and plan on trying some of your food stops, yum! What a beautiful story of your hometown. 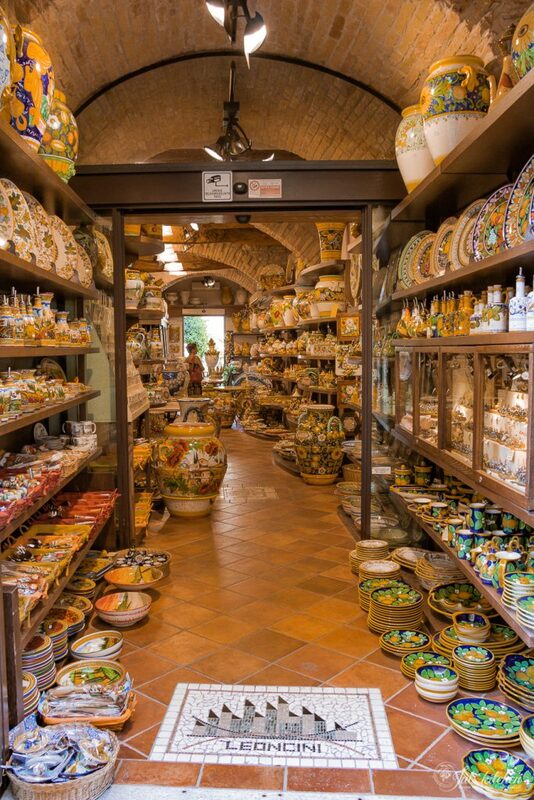 thank you so much Cheryl, I am so happy you had the chance to appreciate San Gimignano! Perfect suggestions! We spent a week in a house just outside San Gimignano and experienced most of these suggestions. There was also a FANTASTIC restaurant that we loved, that was recommended by a local that I can’t temember – what a fantastic dinner. We loved San Gimignano and will definitely be back!! I am so happy you enjoyed San Gimignano! If the name of the restaurant comes to your mind, let me know I’ll be curious to try it!